The calculation of wind loads on a roof is an essential part of the design process. The designer must ensure that the installed roof system is able to resist the wind load induced by a building’s geometry and location and that the correct calculation procedures are followed. The correct calculation methodology for UK Building Regulations compliance is denoted by BS EN 1991-1-4:2005 + A1:2010 when supplemented with the UK National Annex incorporating National Amendment A1 dated January 2011. There was a time when the negotiation for a flat roof was mostly a verbal assurance and a keen price, any additional documentation was added to hopefully impress the client. These days a roofing proposal can be supported by a whole raft of specifications, design documents, reports and technical documentation. When opting for a polymeric single ply membrane roofing solution, one of the key documents is the wind uplift calculation and not just for mechanically fastened roofs, they can be just as important for adhered roofs when in certain locations or possibly with a higher risk of exposure. 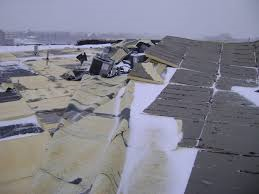 Wind load calculations for flat roofs are of paramount importance and should never be a “rule of thumb” decision. Nor should their reports be seen as a piece of paper to be filed away in the O&M manual, they should be used as a vital tool to enable the roofing system to be fixed securely and remain for the duration. As well as keeping copies in the project file, the installation team should also have copies with them on the project; not only have them but understand them and interpret them. Incorrect installation of the insulation and membrane restraint requirements can lead to premature failure of the construction. It is therefore essential that the contractor is aware of the necessary attachment requirements determined by the wind load calculations. Like other manufacturers and suppliers in our sector we at IKO Polymeric offer the service of providing wind uplift calculation reports for individual projects. These are carried out using specialist software which is backed up with training and support by the software providers. What are we designing against? 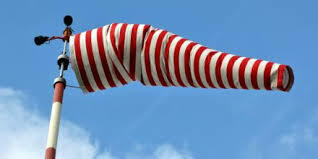 As wind encounters an obstacle in its path the obstacle changes the wind forces which will alter the pressures exerted onto it, When wind strikes a building it is deflected to generate a positive pressure on the windward face. As it passes around the sides of the building and over the roof it creates a negative pressure in its trail. 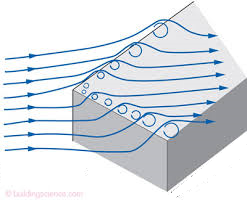 The severest pressures are experienced at the corners and edges of the roof, particularly those facing the prevailing direction where the negative pressure exerted on the roof can be greater than that experienced in the central areas. There are a number of key factors that can have an effect on the wind load on a roof, The height of the building, the shape of the land around it, it’s general location as well as whether it sits in a coastal location. There can also be the issue of positive pressure on the underside of the roof structure that could occur from within the building. This is more likely with lightweight structures and is a prime consideration for buildings such as aircraft hangars and distribution warehouses that are most likely to leave very large doorways open. The calculation is carried out in accordance with BS EN 1991 -1 – 4, the basic information required is an accurate location (typically a post code and if possible, a property number) the height from ground to roof level, roof deck and roof design type (<10°, Mono-pitch, Duo Pitch, Barrel Vault). Additional information such as elevation width and length enables wind zones to be calculated and can be useful to the installation team. Information about adjacent buildings and dominant openings can also impact on the calculation. Using some software packages can help in providing other critical pieces of information such as height above sea level, orography/topography and wind speed. If not available through the software, then this information must be sourced. These days the internet can help greatly with information gathering, provided reliable sites are used. 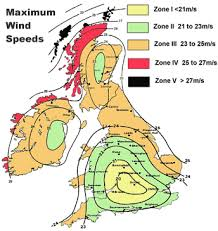 Below is a typical UK wind map. The resulting report gives information of the overall wind velocity which includes factors for direction and altitude. From this a peak velocity figure is calculated through which the design wind loads are produced and eventually into the total pressure for the individual zones. Introducing the fixing characteristic value at this point produces the number of fixings that will be required per m² in each zone. It should be ensured that the roof deck/substrate is sound and suitable to take the fixing load, if there are any doubts or the project is a refurbishment then a fixing pull-out test must be performed to determine the suitability of the substrate. As a company we have a form that should be filled in and will guide the person filling it in to the information required. The Single Ply Roofing Association also produces a form that can be submitted for the calculation. This set of information will enable us to predict the pressures that are likely to affect a particular roof area and we can indicate numbers of fixings required per square meter, based on the performance characteristic of the selected fixing. 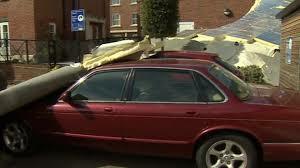 Also, if required, we can advise on the suitability to adhere the roof area. Ensuring we have all the correct information means we can provide the building owner with the security knowing that their roof has been properly designed for its location. Getting it wrong could be costly!